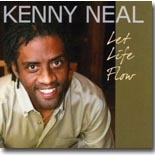 Kenny Neal is back after a short absence with a fine new album, Let Life Flow. It's this month's Pick Hit. New Orleans piano wizard Henry Butler has always put on a great live show, so it really shouldn't be a surprise that his new live album, PiaNOLA Live is this good. It's this month's Surprise hit. A landmark DVD collection of concert footage and a documentary on James Brown is highlighted in this month's Flashback feature. Our What's New section features new releases from Solomon Burke, Mike Zito, Boo Boo Davis, Nellie Tiger Travis, Garnet Mimms, Guitar Red, Barbara Blue, and more, plus reissues from Hollywood Fats with the Paladins and Johnny Nicholas with special guests.